After lurking here for quite a while it's only fair I start sharing some of my projects. If only to get some feedback and see how I'm doing. 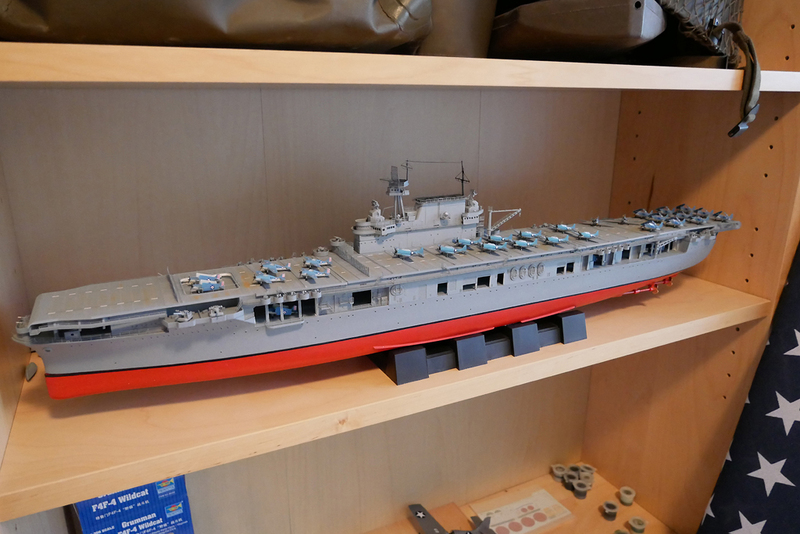 So after building the Enterprise CV-6 ( converted Trumpeter Hornet ) I decided to go for Merit's Yorktown CV-5. I'm building it out-of-the-box, so beside the photo-etch already present in the box I'm not using anything additional. I have been struggling with the hull, did not sand it as I've seen a number of others do, but had a problem with the color of the hull. I had pained it in a darker blue as per Merit's instructions but didn't like it, so opted for a lighter tone. I hope I got that somewhat right. The picture shows the current state of the build so I will post some pictures now and again for anyone who's interested. Oh yes, my level I would describe as 'gifted amateur'. Certainly no pro. Last edited by minispace on Fri Jul 07, 2017 6:10 pm, edited 2 times in total. Nice start. As long as you are enjoying it and having fun, that is what counts. You must be from Belgium or France, or maybe the Netherlands? I thought Buck Danny was a French-Belgian comic series, only published in Dutch and French? It certainly left me with a lifelong passion for carriers too! The ending of it was big part of the inspiration to build a diorama of the last moments of Lexington. Excellent start on your Yorktown! Looking forward to seeing more. Correct. The Netherlands. I have only seen it in Dutch or French. Yorktown and Lexington are therefore somewhat more ´special´. I was surprised later on to see how relatively accurate Buck Danny was. There are obvious mistakes ofcourse but as a whole, not bad at all. The vapor-explosion on Lexington, very dramatic indeed. My next project after this is Akagi, but I was thinking Lexington as well. But Yorktown first, so every now and then I´ll post a couple of pictures. If only to track the progress myself. I'm not overly thrilled with the quality of the kit, some parts fit badly so have to spend a lot of extra time getting it to fit properly. Never done so much sanding. But overall, it's OK.
Last edited by minispace on Fri Jul 07, 2017 6:13 pm, edited 1 time in total. Nice touch with the mural! Don't want to rain on your parade, but; it looks like you put the 5" guns in their mount upside down, the gear should be on the bottom. Otherwise, looking mighty good. Thanks Mark, bit embarassing, certainly looks that way, will have that fixed. Looking good. Yorktown has always been my favorite carrier. Looking forward to watching your progress. Small update. I couldn't change the 5 inch guns anymore ( they were upside down, ahum ) so I had to sand the gear off to kind a mask my mistake. Fitted a few more details. 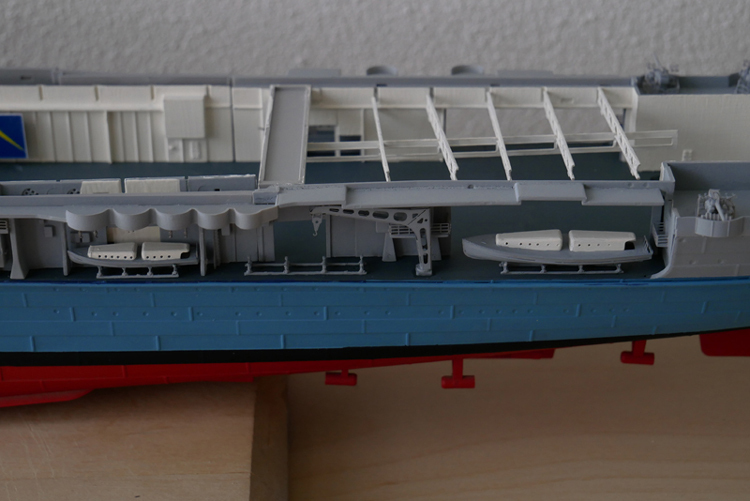 On the picture below, the hangar details are dry-fitted very roughly, so no worries. Still not happy with the hull colour though, unsure what to do. Also decided to give myself some extra work by adding spare-TBD's to the hangar roof. I saw this on a picture from the Enterpise and quite liked it. Not sure how much you can see once the model is finished but in that case, I know they're there. Will also add the Wildcat to the hangar roof as per one of the last pictures onboard the Yorktown during salvage operations shortly before sinking. This is my third carrier. My second carrier was the Trumpeter Hornet, made into the Enterprise ( at least I tried to ) which saves me having to build or buy a lot of planes. They will move from the Enterprise. That in return will get the planes I got left-over from the now 'sunk' Yorktown CV-10 ( my trial-carrier first model sold for scrap ). Still an awful lot to do though but I was at least a bit happier with Merit. The Flight Deck dry-fitted beautifully, was happily surprised. Last edited by minispace on Fri Jul 07, 2017 6:19 pm, edited 1 time in total. Hi Arno. Get yourself some lycra rigging line. There are a few brands. I like and use Infini Model's lines. 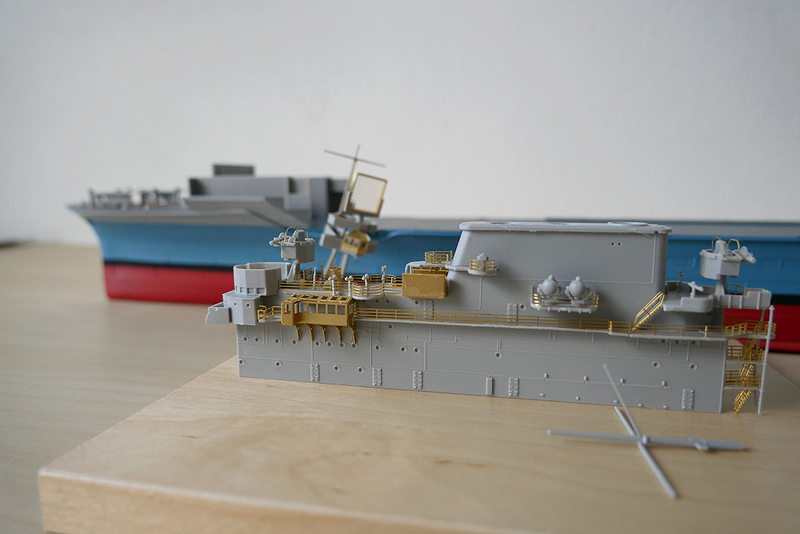 They are very thin and like real rigging is only really there if you look for it rather than dominating the model. It's fairly idiot proof to use and very robust long term. 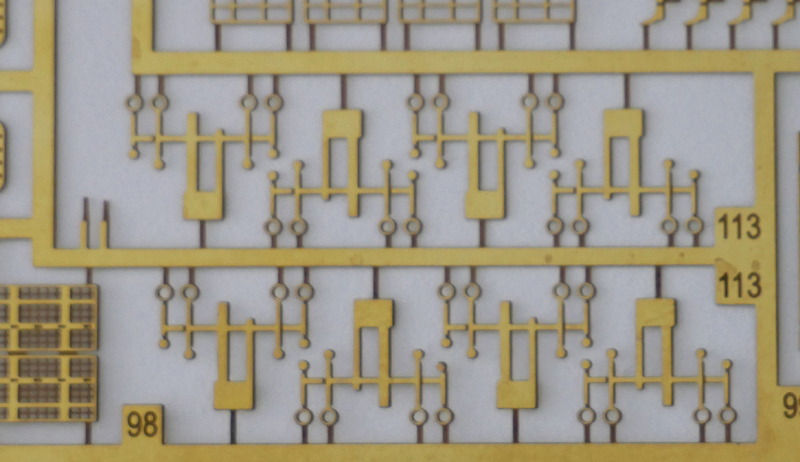 You could try heat stretched sprue which is free, but getting consistent thickness is important and it is incredibly fragile once on so a glass cabinet is a must to protect the model. For rigging I like Fine EZ line and Modelkasten .06, both are stretch and don't require a lot of tension to look taut. Finished the hangar deck. Ready for the flightdeck. Put in a small touch, one of the pictures with the Yorktown mural in it had a F4F-4 Wildcat no.16 upside-down in the hangar. I tried to recreate that scene. 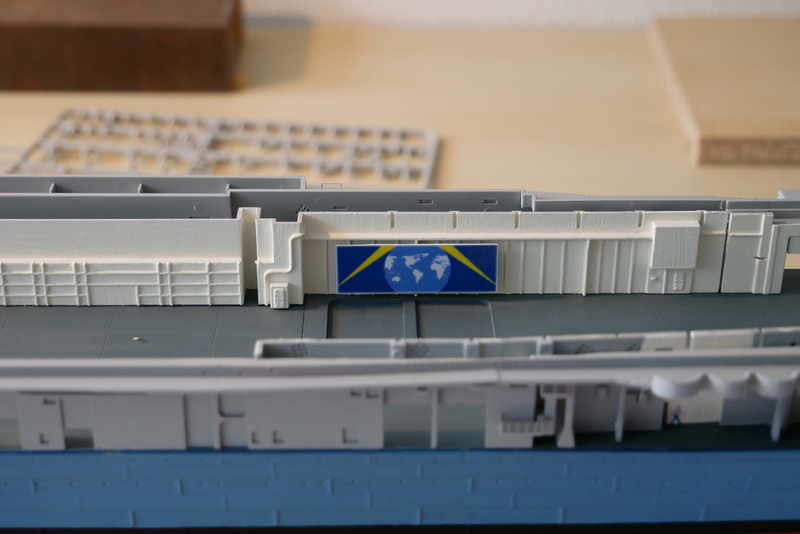 Total view of the hangar deck before the flightdeck is put on. Last edited by minispace on Fri Jul 07, 2017 6:21 pm, edited 1 time in total. Wow and lets say outstanding. Keep it up. 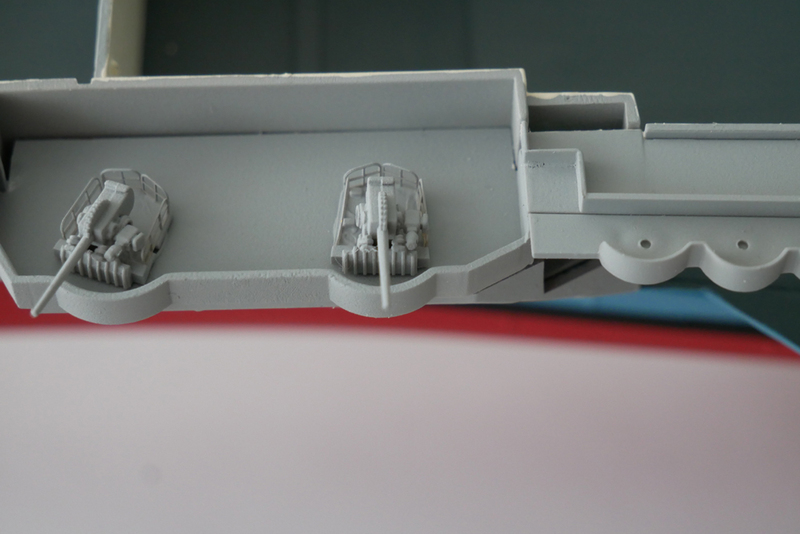 Also, on the 1.1 gunmounts just forward of the bridge. According to the manual, there should be some kind of rangefinder there + railings. But I've seen no photographic evidence of this so I omitted them. There also a good picture in the Robert Ballard book of that section. I will just put a shield in front of the gun. Last edited by minispace on Fri Jul 07, 2017 6:22 pm, edited 1 time in total. Have a question, perhaps someone knows; flight deck markings. In the Merit box, they're bright white and really stand out. But as I'm modelling the Yorktown during the Battle of Midway, I didn't see ANY evidence of these markings being present on the deck. No picture shows any markings as far as I can see. 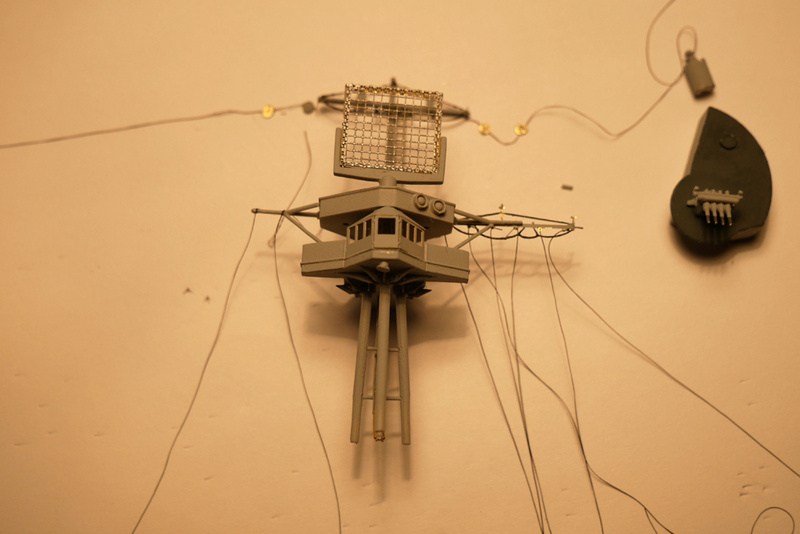 So I'm thinking of putting none on, just the arresting wires on the deck. Does anyone know of any marking on the flight deck during the Battle of Midway ? Actually, I did find a picture in the Legends of Warfare book, page 111. Just before the bow slips beneath the waves. Grey-ish flight deck markings in the center way up to the end of the flightdeck. Haven't seen that anywhere online though. Means all models I've seen sofar are wrong in this respect. Also shows up on page 59 very faintly.